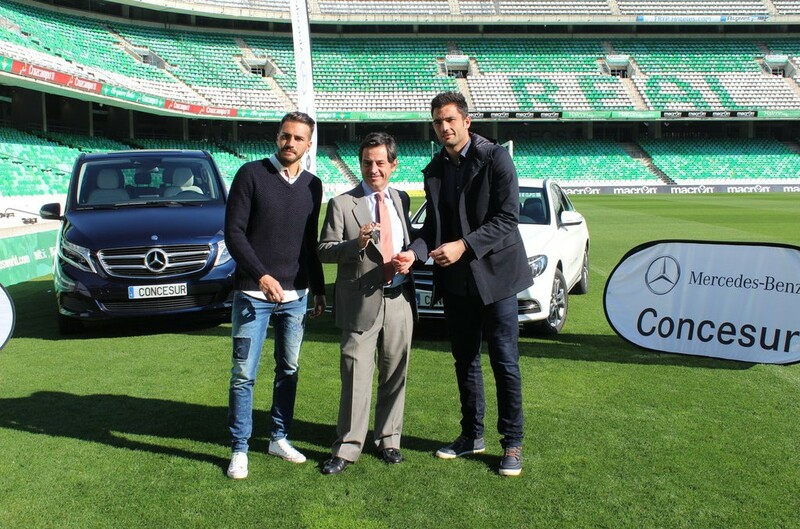 Real Betis and Mercedes-Benz have just signed a partnership and promised to go higher in ranking together. Betis is dreaming of turning the Benz slogan into reality. From the 4th place in Segunda Division, they want to go back into La Liga and get „the best or nothing”. Back in La Primera Division with the speed of a Mercedes-Benz. This is what Real Betis is planning, from the 4th place in La Segunda. And in order to do just that, the Spanish football club from Sevilla has signed a deal with the German manufacturer. Mercedes is now the official car of the club. The president of Concesur Mercedes-Benz, Joaquin Fernández Vial, has announced the deal. Down on the grass, the players of Real Betis have twirled around the newest of models. Antonio Adán and Xavi Torres were the stars at the soccerfield exhibition at the 52,000 seats “Benito Villamarin” Stadium. The 27 year old goalkeeper and the defensive midfielder, who also played for Barcelona, went into the spotlight together with the cars displayed on the grass. After the photo session requested by the large number of media present at the venue, once they got hold of the keys, both of them got inside the vehicles. “This was the moment we have been waiting for”, they said showing excited grins. Stay tuned to find out what grand stadiums of the world bear the Mercedes-Benz logo!